The status of Viking women may be underestimated due to the way we interpret burial findings. 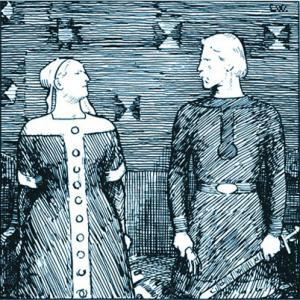 “To assume that Viking men were ranked above women is to impose modern values on the past, which would be misleading,” cautions Marianne Moen. She has been studying how women’s status and power is expressed through Viking burial findings. Her master’s thesis The Gendered Landscape argues that viking gender roles may have been more complex than we assume. Exploring new perspectives of Viking society is a theme which also will be the focus of the forthcoming Viking Worlds conference in March 2013, where Moen is a member of the organising committee. Our assumptions of gender roles in viking society could skew the way we interpret burial findings, Moen points out. She uses the 1904 excavation of the Oseberg long boat to illustrate the point. Rather than the skeleton of a powerful king or chieftain, the ship surprisingly contained two female skeletons. “The first theories suggested that this must be the grave of queen Åsa mentioned in Snorri’s Ynglinga saga, and that the other skeleton was her slave servant,” says Moen. Åsa Haraldsdottir was the mother of Viking king Halfdan the Black. However, later carbon dating revealed that the buried ship was from around 834 AD - a date which made this theory unfeasible. But the idea of a queen mother and her servant became persistent amongst archaeologists. ”Since the Oseberg mound contained two women, the burial site has been analysed as a unique find, without reference to similar sites. 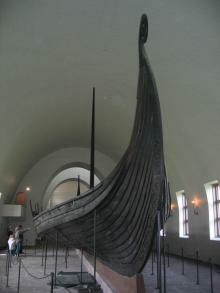 The finding is very similar to the Gokstadskipet long boat, which is regarded as the grave of a powerful and influential king. So why isn’t Osebergskipet regarded in the same way?” asks Moen. And although we accept that some Viking women may have had a role as religious figures (as a ‘volve’) performing rites, we do not accord them the corresponding power they would have had in a society where religious and political power was intertwined, Moen argues. Moen feels many archaeologists have put too much emphasis on historical texts, such as Snorri Sturluson’s sagas. The fact that far more graves of men than women have been found from this era has also been seen as an indication that men were more powerful. But it might not be that straightforward to identify a grave as male or female, Moen suggests. Usually archaeologists have to rely on artefacts to gender identify a grave, due to a lack of human remains. But the presence of male objects (such as swords, shields or spears) or female objects (jewellery, fabric and weaving artefacts) does not conclusively prove the gender. Added to this, the larger metal objects usually found in male graves are more likely to be discovered after hundreds of years - while smaller female objects such as brooches (and hence, female graves) can remain undetected. “If it is the case that women belonged to the private sphere of the home and men were in the public sphere of society, this should be reflected in the burial landscape,” Moen points out. But in the Kaupang area she has studied, female graves are side by side with male graves – and just as prominent. “Since the Viking era became an important part of building Norwegian national identity in the 19th century, early archaeology was influenced by Victorian ideals. The contemporary ideals of women belonging to the home and men being out in the public was imposed on Viking society,” says Moen.